Home / Blog / You Suspect Your Teen Has a Drug Addiction, What Do You Do Next? The signs are there. Your teen has had drastic changes in behavior. Maybe he’s been more secretive and withdrawn. Maybe she’s been failing her classes at school. Your teen may be sick more often or looks pale and thin. Maybe you’ve found drug paraphernalia in her room or backpack. Maybe you’ve actually caught him when he was stoned. It’s one of the worst feelings for parents, the realization that their teen has a drug problem. Sometimes parents are in as much denial as the teen addict. It’s not an easy truth to face, and once you have faced it, then you have to decide what to do next. 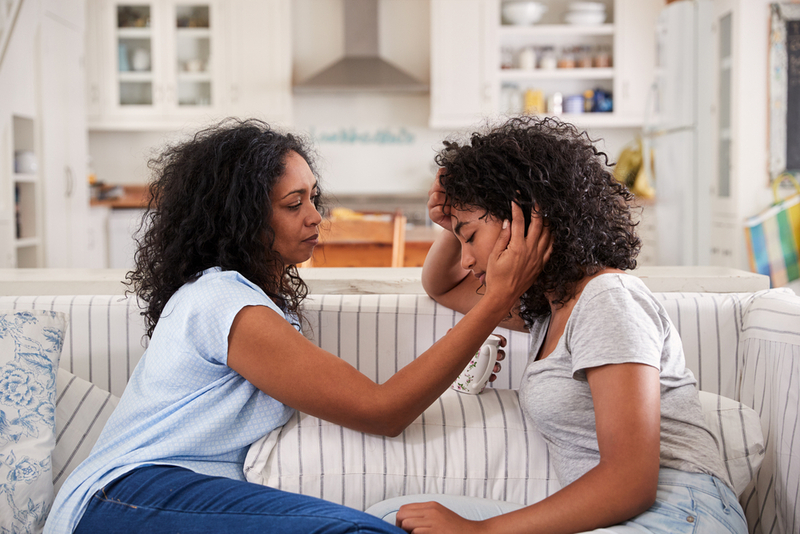 Before you talk with your teen, take some time to deal with your own emotions. Many parents immediately blame themselves, or get angry at their teen, or blame their teen’s friends. Some parents are so embarrassed that they cannot talk about the situation. Know that your teen’s addiction is not your fault. This is not a time to place blame. This is a time for decisions and action. What you need is to have a plan for helping your teen with this addiction, and that plan includes getting the assistance of people who know how to help. Begin by educating yourself on teens and addictions. Talk to a counselor, therapist, or doctor who specializes in teen addiction and recovery. Reach out to a school counselor, or groups online or in your community who can provide information and advice. Make sure you are well-informed on the topic before you try to talk to your teen about it. Talk with your child’s other parent. Whether both parents are married or not, this is a time when they need to agree on the best course of action, and present a united front to their child. Your teen needs to know that you both love him or her, and you both want to help. Discuss with the other parent, or if you’re a single parent, decide for yourself – what is the best way to help your teen with this addiction? Should your teen enter an outpatient or inpatient treatment program? Don’t be fooled by your teen’s promise to just quit. Addiction requires professional intervention. Know what treatment options are available and be prepared to discuss them with your teen. Invite your teen to be a part of the decision. An advocacy group like HelpYourTeenNow can help you to research addiction programs and chose the best one for your teen. When you get ready to have a conversation with your teen about his or her drug addiction, remind yourself that the best thing you can do is to remain calm throughout the conversation. You can expect your teen to react with anger, to deny using drugs, to accuse you of snooping, and to tell you it’s none of your business. Know that this reaction is coming. Do not let it pull you into an angry confrontation. Remind your teen that you are approaching this situation from a place of love. That it’s your job to provide help and guidance. That not facing up to the addiction and not getting help is not an option. One of a parent’s worst nightmares is to realize that their teen has a drug addiction. Feelings of anger, guilt, fear, and embarrassment rush in. Seek out help for dealing with your own feelings, and then learn about addictions and where to get help. Stay calm when you talk to your teen about his or her drug use. Don’t get taken in by angry denials or promises to quit. Make a plan to get addiction treatment for your teen. Take advantage of resources that can help you find the right kind of treatment. Let your child know that you are acting out of love, and arranging for a treatment program is the most loving thing you can do in this situation.